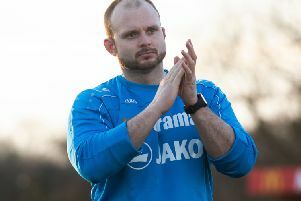 Hemel Hempstead Town manager Dean Brennan is expecting a tough test when his side travel to Sutton United for Saturday’s National League South clash. The Tudors go into the game on the back of a 3-0 win over Bury Town in the FA Trophy, but Brennan knows his side will need to be at their best if they are to return home with three points on Saturday. “They are a very good side, Sutton, I’ve got to be honest - a very, very good side,” he said. “They are excellent going forward and they are a good football club who are run properly. “They have brought in some very good players and we are expecting a very, very tough game on Saturday. “It’ll be a good game because they are attack-minded and we are attack-minded; every time we have played against each other they have been good, tight games so we are looking forward to it. “We will be going there to win the game, but we know we will have to defend well because they have got some very good forwards and good wingers. “There is a lot of experience throughout their squad, and I will be shocked if Sutton don’t finish in the top-five this season. The Tudors will be without Ed Asafu-Adjaye and Jamie Slabber for Saturday’s game, but Matt Spring and Kyle Connolly return to the squad, along with new signing Victor Adeboyejo who arrived on loan this week from Leyton Orient. “But Matt Spring is back and Kyle Connolly is back so hopefully we will be able to make better moves with our substitutions as the squad is looking a bit stronger. Hemel have struggled with injuries so far this season, but there has been a sliver lining as a number of the club’s youngsters have been given first team opportunities; including two academy players who were included among the Tudors subs in the FA Cup tie at Bury Town last weekend. The injury to Slabber, along with John Frendo’s loan move to Hitchin Town, leaves the Tudors looking relatively short on numbers up front, but Brennan feels the players at his disposal are more than capable of getting goals. “We’ve brought Victor in on a youth loan from Leyton Orient so he will come in and be involved this weekend,” said Brennan. “We’ve got Willy (Gnahore) and Jamal Lowe, so we will give them a chance – it’s up to them to sink or swim.